I recently received a package of clay tools, shape cutters, texture sheets and a sampler pack of oven bake clay from Sculpey for the tutorial exchange held on Totally tutorials --thanks Kym! Check out www.sculpey.com for more fun projects with clay, and be sure to check out Totally tutorials for tons of tutorials of all kinds! 1. Gather your supplies. Download the pattern for the beak, breast and wings. Cover your work surface with waxed paper. 3. Break a toothpick in half and insert into the neck area. This will secure the head. To make the head condition and roll some green clay into a 1-inch ball. Put pressure on one end slightly to narrow the neck area slightly. (See photo) and insert onto the body. 4. Trace the breast pattern onto a piece of paper and cut out. Place it on some thinly rolled out brown clay and using an X-acto knife, cut it out. Press onto the front of the body with your fingers. 7. Make a thin snake from a tiny amount of brown clay by rolling on your work surface. Press onto the bottom tips of the wings on each side and cut off the excess. Repeat this step with some lt. blue clay. Use the needle tool to press in lines on each wing tip. (See photos) While you have the needle tool press some downward facing lines on the breast as well. 8. Cut out the beak pattern and roll out some yellow clay a bit thicker than you did for the other pieces. Cut out two. Using a ¾” piece of a toothpick lay it on one beak piece and then press the other piece on top leaving a small bit of toothpick exposed. (Basically you are sandwiching the toothpick between to beak pieces) Use a pointed end of a clay tool to press in two indentations in the beak. Carefully insert into the head. (It may be easier to make pilot hole in the head with the needle tool) Use the blunt end of a clay tool to press all around the area where the beak is attached to the head. 9. For the feet, roll a piece of yellow clay into a ½” ball. Flatten slightly with your fingers and shape one end into a rounded point. Use the pointed end of a clay tool to make three indentations (webbed foot) then use the same tool to drill a hole all the way through the foot. Repeat for the second foot. Each foot will be ¼” in thickness. 10. Roll out a piece of white clay thinly and cut into a 1/8” wide flat strip. Attach around the neck and press to secure. 12. Optional step: Roll out some black clay very thin and using the leaf cutter cut out three shapes. 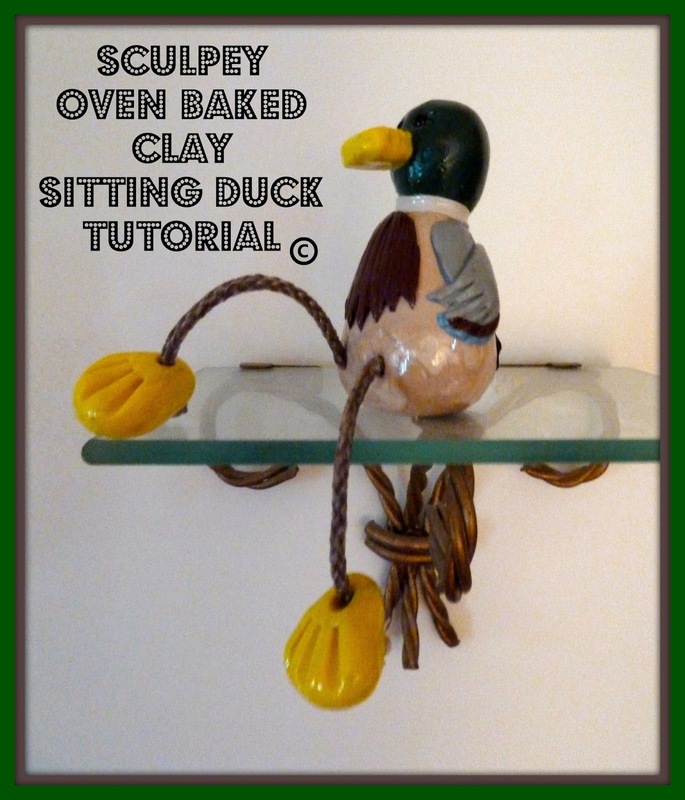 Turn the duck to the back and attach to the bottom to represent tail feathers. 13. Cover a baking sheet with aluminum foil and bake the body and feet in a pre-heated 275-degree oven for 15 minutes per thickness. (About 45 minutes) Do not over bake. Do not use a microwave oven. After the pieces have cooled, brush on a thin coat of Sculpey gloss glaze and let dry. 14. Cut two pieces of tan cord or thick yarn 5 inches each. Use a dab of glue on the ends to stop fraying if necessary. Thread one end of the cord through the hole in a foot and knot it to secure. Repeat with the second cord and other foot. Dab a bit of glue in a hole in the body and using the blunt end of a broken toothpick push the opposite end of a foot with the cord into the body, and repeat for second foot. Let dry. 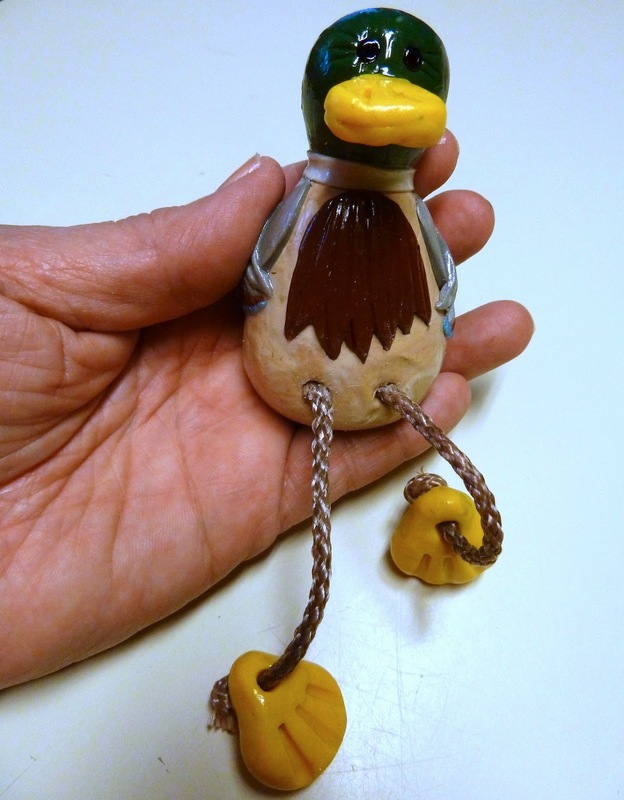 Note: I made him as a Mallard but you can easily make him in any color. 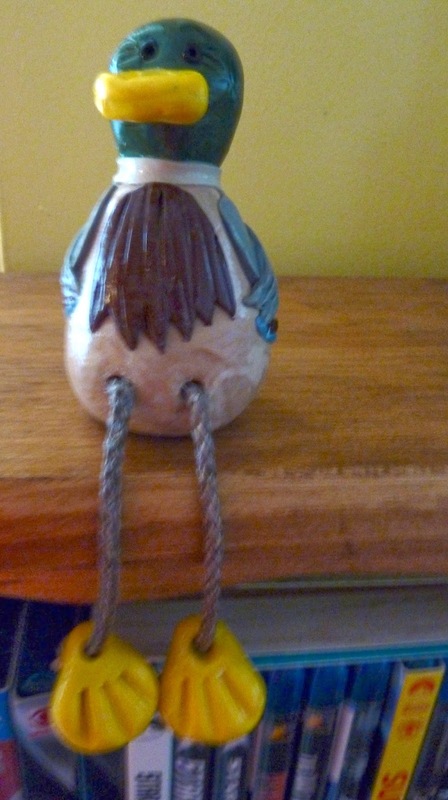 And wouldn't he look cute with his legs hanging over the side of an Easter basket? aww he is such a cutie. I have recently purchased some sculpey and fell in love with it. :) it's easy to work with. Oh I just love him! I'm visiting from Serenity Saturday blog hop. He is too cute! I agree, in an Easter basket would be adorable!! !